Geomorphological evolution and monitoring of San Bernardino-Guvano landslide (Eastern Liguria, Italy). The San Bernardino-Guvano landslide is one of the wider slope mass movements located along the eastern Ligurian coast between Vernazza and Corniglia, Cinque Terre National Park. It is an ancient and complex landslide that has been studied since 1853, when a catastrophic event occurred. 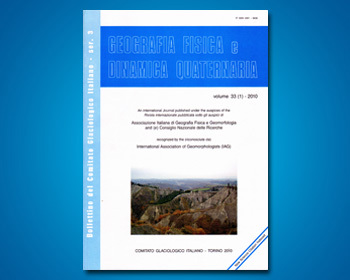 This paper aims to describe the geomorphological evolution and monitoring of this coastal landslide: both geological and geomorphological field surveys supported by airborne imagery were carried out, as well as bibliographical research about past geotechnical investigations and topographical monitoring; furthermore, a new single-frequency Global Navigation Satellite System (GNSS) low-cost monitoring started in October 2015. Structural geology heavily influences the stability of this coastal slope: a fault cuts the landslide area N-S, as well as low-angle thrust fault planes with NE dip direction. The slope is affected by landslides with different intensity and kinematic evolution, in particular rockfalls and debris avalanches along the scarp and right flank and earth flow along the central sector and at the slope toe. Man-made structures are relevant and they mainly consist of retaining walls, drainage channels, buildings, hiking trails, roads and railway infrastructures. Data obtained by GNSS receivers have shown remarkable displacements during the last year, according to the results of previous topographical and geotechnical monitoring campaigns. Deep analysis of GNSS data, together with the support and maintenance of the actual monitoring program, will allow a better comprehension of the slope stability condition, essential for supporting the design of proper risk reduction interventions.